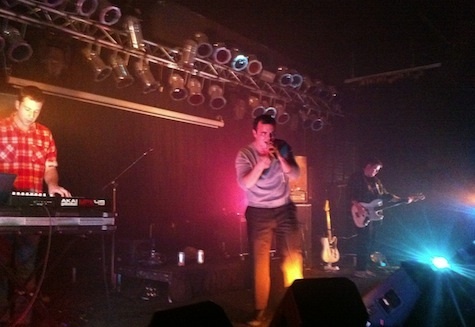 Future Islands at The Waiting Room, Nov. 2, 2011. So here’s the deal: If I didn’t have a “real” job and didn’t have to get up at 5 a.m. tomorrow morning I would be driving to Lincoln tonight for the kick off of the 10th Annual Lincoln Calling Festival. More specifically, I’d be driving up to see Future Islands, who is playing at The Bourbon Theater with Life Is Cool and Powerful Science. Future Islands’ sound reminds me of Factory Records-era post-ambient rock a la Joy Division. The trio’s sell point is frontman Samuel T. Herring, who is absolutely mesmerizing with his over-the-top theatrical performance. Or at least it was when the band played to a small audience at The Waiting Room back in 2011. You can see more detailed descriptions of that show online right here. Needless to say, tonight’s show, which starts at 9, is well worth the $10 tickets, but not worth me losing my job. The only other show on the Lincoln Calling slate for tonight is “Troubadour Tuesday” at The Zoo Bar featuring Lucas Kellison, All Young Girls Are Machine Guns, Cory Kibler and Virtuopath. That show is $4 and starts at 9. More details on Lincoln Calling is available from their website. Back here in Omaha, Portland singer/songwriter Todd Snider headlines at The Waiting Room with The Coal Men. The $20 show starts at 8. And speaking of The Waiting Room, I just noticed in the One Percent blast email received this morning that Lee Renaldo and The Dust has been added to Friday night’s Built to Spill show. Renaldo’s new album, Last Night on Earth (Matador, 2013), is about as close as you’re going to get to Sonic Youth these days. It’s a dynamic double-bill, priced at a mere $22. Anyway… O’Leaver’s also is hosting a show tonight with Las Vegas band Rusty Maples and local act Morning at Sea. $5, 9:30 p.m. While down at Slowdown Jr. it’s singer/songwriter Andrew Belle with Neulore and our very own Brad Hoshaw. $12, 8 p.m.